Are You Looking For Carbs That Can Help You Shed Excess Pounds?…Cannellini Beans! These beans store carbohydrate starches in a form of fiber that resists digestion. That means the starches do not break down into fat – because the fiber contains proteins that block the enzyme amylase from digesting the starches. So they pass through the body with the fiber, without spiking insulin or blood sugar! 1. In a pan, heat the coconut oil until shimmering. 2. Add the celery, carrots, and onion, and cook, until the onions are softened, about 4-5 minutes or so. 3. Add the garlic and cook, stirring constantly, for another minute or so. Remove from heat and set aside. 4. Meanwhile, in a large pot over medium-high heat, bring the water and the vegetable broth to a boil. 6. 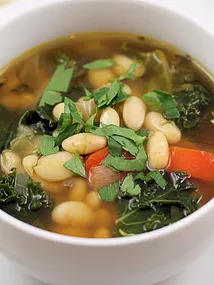 Add the beans, kale, and the cream (if using) and cook, stirring frequently, until completely heated through and the kale is wilted, about 10-15 minutes. Season with salt and pepper to taste.